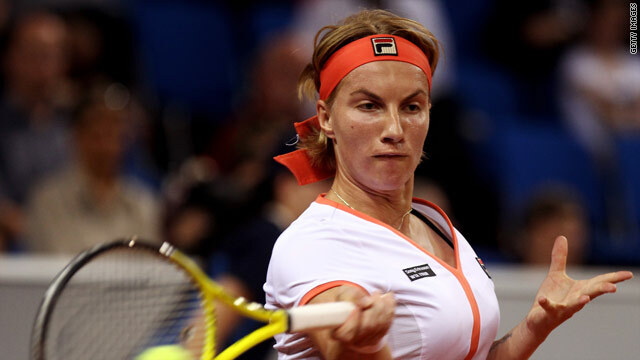 Svetlana Kuznetsova is safely through as she starts the defence of her French Open title. Holder Svetlana Kuznetsova overcame a shaky start to reach the second round of the French Open with a straight sets victory over Romania's Sorana Cirstea on Sunday. Cirstea, world ranked 34th, just missed out on a seeding -- and had the Russian in trouble in the first set when taking a 3-1 advantage. But the sixth seed -- who had won just one clay-court match this year prior to facing Cirstea -- suddenly found her form in devastating fashion, winning 11 of the next 12 games to run out a comfortable 6-3 6-1 winner. "I was not showing the good results I would have liked to, but I knew this moment had to pass because I deserve better than that," the 24-year-old told AFP. Kuznetsova next faces Andrea Petkovic of Germany, who fought back from dropping the opening set to defeat another Russian, Elena Vesnina, 4-6 6-1 6-4. Second seed Venus Williams, who has never won at Roland Garros, also began her campaign with a comfortable victory, 6-3 6-3 over Swiss veteran Patty Schynder. However, there were some shock results on the first day at Roland Garros, with defeats for 10th seed Victoria Azarenka and Spanish 20th seed Maria Jose Martinez Sanchez. Belarussian Azarenka reached the Paris quarterfinals last year, but has been suffering from a succession of injuries recently and was blown away 6-1 6-2 by the dangerous Gisela Dulko of Argentina. Meanwhile, Martinez Sanchez, who knocked out both Jelena Jankovic and Caroline Wozniacki on her way to a shock success in last month's Rome Masters, slumped 6-2 6-4 to Uzbekistan's world 97 Akgul Amanmuradova. Slovakia's Dominika Cibulkova, who is seeded a lowly 26th despite reaching the last four here in 2009, is also safely through after beating Russia's Ekaterina Ivanova 6-2 6-0.